top: kniphofias in a Mid Summer border, underlit with white Japanese anenomes. 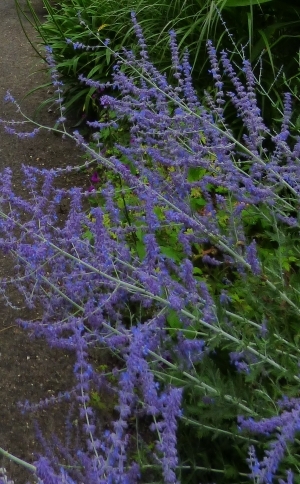 above: a welcome familiar site, sprays of Perovskia atriplicifolia, aka Russian Sage. right: my one photo of Borde Hill. this is the Paradise Walk, billowing with many species we can use in the Bay Area. 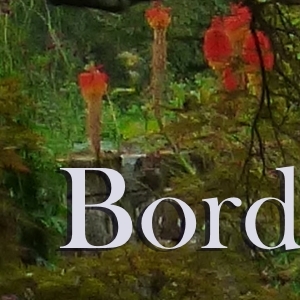 Borde Hill, in West Sussex, was the first stop on my 2016 tour of British and Dutch gardens. It was also my first casualty, I only took one photo. I could blame it on jet lag (I hit the ground running... as soon as I found the van with Mike, Jeannine and Frank ), but really, it came down to my own narrow determination to find styles and elements I liked that I could use back in San Francisco. Borde Hill is a veddy veddy British (careful with the adjective 'English') Garden, in a climate that obviously gets rainfall year-round. It was the first day of August, so the roses, magnolias, azaleas, the other roses, and rose-a-dendrons had long ago peaked (is it obvious I'm writing this in February, the middle of stab-the-gardener rose pruning season?). I decided this would just be a practice garden for me and not to expect much. The garden consists of several rooms, including an Italian garden, again, not my thing, but to reach it you travelled the Paradise Walk, planted for Summer blooms, with many familiar species, including agapanthus, geranium, kniphofia, anenome and nepeta. But regardless of my prejudices, Borde Hill is quite impressive. Built in 1598 by Sir Stephen Borde, it passed through several alterations, additions and families before the purchase in 1892 by Col. Stephenson R. Clarke, marking the beginning of the garden you see today. The Clarke family was the first to focus on gardening, patronizing some of the great contemporary plant hunters- Ernest Henry Wilson, George Forrest, Frank Kingdon-Ward, Reginald Farrer and Joseph Rock. The result is an extensive collection of the rare and exotic, as well as an astounding number (83!) of 'Champion trees', record holders for their species by height and/or girth in Britain and Ireland. Mike and Frank had visited Borde Hill two years prior, earlier in the Summer (when the roses were at their pique) and met the creator of the Jay Robbin's Rose Garden, Mrs. Eleni Stephenson Clarke. Inspired by an article in Country Life from 1902, she commissioned garden designer Robin Williams to draw up a design using her favorite David Austin selections. He expanded that to 75 varieties, and 2016 marked the 20th Anniversary of the rose garden. I don't know whether she spied us taking a short cut through an off-limits area (we didn't know!) or just felt like being immersed in her wonderful garden, but we got to say hello on our way out. However, we couldn't stay and chat, for we had dinner reservations, at Gravetye Manor .